Vanilla is a flavoring agent that is derived from the fruit of the vanilla orchid. It is grown throughout the tropics, with Indonesia and Madagascar being the largest producers. Today, about 80% of the world’s natural vanilla comes from smallholder farms in Madagascar.1 The process is extremely labor-intensive. Plants may take 4 years to reach maturity and begin producing fruit. Flowers must be hand-pollinated, and beans are harvested, blanched, and dried by hand. Then entire process from bean to usable vanilla pod can take 6 to 8 months. Other factors such as severe weather conditions, crop failure, political unrest, low wages for farmers, and premature harvesting of beans also influence cost. Established in in 2015, the initiative is supported by major food companies’ switching to all-natural vanilla to meet consumer demand. Responsible sourcing hopes to help farmers earn fair wages and decrease the price volatility that has become more common with ingredients like vanilla and cocoa. Unlike the situation with cocoa, there are alternatives when it comes to vanilla flavor. Resistance to the abundant use of chemicals in packaged foods allowed the organic market to find a foothold. The push toward all-natural ingredients seemed harmless enough 20 years ago. Though natural is not a clearly defined concept in food labeling, we do have clear laws defining organic food. 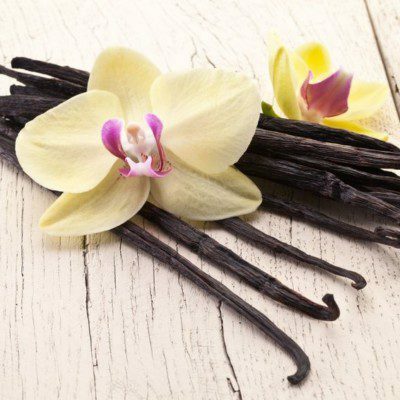 If you are reassessing your margins and notice that organic vanilla is a major expense, you can consider a vanilla WONF or artificial vanilla flavor. You could be reducing your carbon footprint and your costs by going artificial. Flavor agents produced in a controlled laboratory setting undergo rigorous quality control at every stage, and do not require a lengthy, labor- and resource-intensive extraction process or acquisition of naturally rare or difficult-to-cultivate materials.4 From a chemical standpoint, vanillin is the same whether it is extracted naturally or produced synthetically. Artificial vanilla flavor can also withstand the high oven temperatures typical in baking without losing aromatic and flavor compounds. As we continue pushing forward into the 21st century, sustainable sourcing of raw materials like vanilla will guarantee the crop will not go extinct. But when it comes to feeding people on a global scale, can we really sustain such a labor-intensive crop? Where do you stand on artificial versus all-natural flavorings? Bomgardner, M.M. The problem with vanilla. C&EN Global Enterprise 94.36 (2016):38-42. http://cen.acs.org/articles/94/i36/problem-vanilla.html. Accessed 12 July 2017. MINTEC. Shortage in vanilla market drives prices higher.. 4 April 2016. https://www.mintecglobal.com/2016/04/shortage-in-vanilla-market-drives-prices-higher/. Accessed 12 July 2017. Fusaro, D. Driving sustainability in the vanilla supply chain. Food Processing. 8 December 2016. http://www.foodprocessing.com/industrynews/2016/driving-sustainability-in-the-vanilla-supply-chain/. Accessed 6 July 2017. Kennedy, R. The flavor rundown: natural vs. artificial flavors. Science in the News. Harvard University Graduate School of Arts and Sciences, 21 September 2015. http://sitn.hms.harvard.edu/flash/2015/the-flavor-rundown-natural-vs-artificial-flavors/. Accessed 12 July 2017.